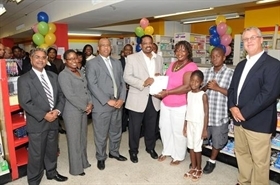 In an historic moment for healthcare in The Bahamas the National Prescription Drug Plan was launched on Monday (Sept. 20) at Lowe’s Pharmacy, Soldier Road with the first swipe of an Ace Prescription Card by pharmacist Rosita Smith on behalf of 12 year old beneficiary Jonathan Wilson. Declaring the plan officially launched Minister of Health the Hon. Dr. Hubert Minnis said the Plan would eliminate the long waiting lines at PMH and public clinics. “Today we are here at Lowe’s Pharmacy which was the first pharmacy to sign on with the National Prescription Drug Plan to launch this new initiative, a partnership between public and private sector, so that individuals rather than receiving their medication or waiting in line at the PMH or even some of our public clinics can attend or visit the private sector and receive medicine at a participating pharmacy near to them. This is excellent in that we would no longer see the waiting lines that we see… so on behalf of the Government of The Bahamas I want to officially launch this National Prescription Drug Plan so that beneficiaries can now receive their medication at all the participating pharmacies,” Dr. Minnis said. The Minister commended the National Insurance Board and the Ministry of Health for “an excellent” job in putting the programme together and thanked the public for supporting the development of the ground-breaking initiative over the past two and half years. Jonathan Wilson, 12, the first Ace Prescription cardholder to benefit from the plan, suffers from asthma along with his sister Raven, 7. Mrs. Raquel Wilson, mother of Jonathan and Raven received the first medicine to be dispensed on behalf of her children. The excited mother said she welcomes the plan because she spends up to $550 monthly on medicine and can now obtain medicine and drug supplies at no cost to treat her children’s condition. “It feels great to know that finally we have a plan in place whereby we can help one another and I can help my kids. Instead of buying one medication to share between two children it’s great to be able to buy two at one time to make sure that they have enough to last. I want to say thank God we finally have a relief!” Mrs. Wilson said. William Cash, CFO of Lowe’s Pharmacy, the very first pharmacy to sign on to the Plan, said he was delighted to see the Plan become a reality. “We’ve been watching this since we signed up in April. There were some tense moments and we thought that maybe we wouldn’t be ready but here we are. Everything is ready to go. We’re welcoming it and a job well done to the NIB team and the National Prescription Drug Plan,” Mr. Cash said. Also present at the launch Algernon Cargill, Director of the National Insurance Board, said now that first Phase has been launched planning will begin for Phase II. “We’re very excited that we were finally able to launch the National Prescription Drug Plan primarily because we can now bring prescription medication to thousands of Bahamians and provide them with the tools in order to manage their chronic ailments. And now that we’ve launched Phase I we’ll be able to plan for Phase II which is going to be even bigger than Phase I,” Mr. Cargill said. Tami Francis, Manager of the NPDP, said the Prescription Drug Plan will positively impact the health and lives of thousands of Bahamians - approximately 35,000 in Phase 1 and, eventually, some 100,000 persons throughout the length and breadth of The Bahamas. As of Tuesday, September 21st, following the official launch of the Plan, Ace Prescription Card holders will be able to use their ACE Prescription cards at participating pharmacies to obtain, free-of-charge, more than 160 prescription drugs and medical supplies as described in the NPDP formulary and prescribed by their physicians. To date, 30 private pharmacies in 35 locations throughout The Bahamas and all public pharmacies have signed on to the NPDP. Phase I of the National Prescription Drug Plan covers four groups of beneficiaries including NIB pensioners, Bahamian citizens over 65 years of age, NIB invalids and children under 18 or full-time students up to 25 years of age. The eleven chronic diseases covered by the Plan include arthritis, asthma, breast cancer, diabetes, glaucoma, high cholesterol, hypertension, ischaemic heart disease, major depression, prostate cancer and psychosis. To date some 10,000 persons have registered for the Plan and distribution of ACE Prescription cards continues for approved beneficiaries at NIB headquarters, Blue Hill Road and at NIB officesthroughout The Bahamas. Eligible persons who have not yet registered for membership in the Plan may still register. Registration forms may be obtained from NIB offices and these forms must be filled out by the applicant, validated by a licensed medical practitioner, and then returned by the applicant to an NIB office. THE DRUG PLAN IS HERE – Phase I of the National Prescription Drug Plan (NPDP) was launched on Monday evening at Lowe’s Pharmacy, Solider Road by Minister of Health the Hon. Dr. Hubert Minnis. Dr. Minnis presented the first prescriptions dispensed under the Plan to Racquel Wilson, mother of beneficiaries Jonathan Wilson, 12 and Raven Wilson, 7. Pictured from left: Dr. Stanley Lalta, Project Manager, NPDP; Tami Francis, Manager, NPDP; Algernon Cargill, Director, NIB; The Hon. Dr. Hubert Minnis, Minister of Health; Racquel Wilson; Raven Wilson; Jonathan Wilson; and William Cash, Chief Executive Officer, Lowe’s Pharmacy. (TCL photo by Wendell Cleare).